Efforts to plant and maintain trees in the District may be starting to pay off. 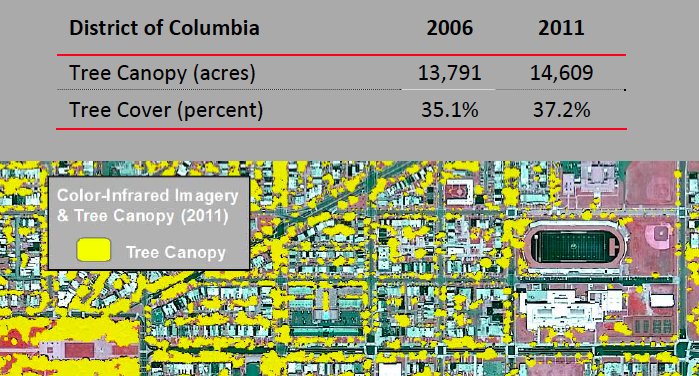 The Urban Forestry Administration (UFA) just reported that the DC land area canopied by trees is 6 per cent larger than previously reported. As of 2011, UFA says, 37.2 per cent of DC land was canopied; previous assessments found 35.1 per cent of DC land to be so. Also tree protection has stepped up, thanks to better city planning and permitting, greater care by DC Water and local activism. For a jurisdiction to achieve a net canopy gain, large treed areas must not be cut. Proof in the breach is Ward 3, which was the only ward losing trees in the new analysis. But Ward 5, which is four times larger than Ward 2, added just 84 acres of tree canopy. Annapolis, MD has 45 percent of its land canopied; and 44 per cent of the land area Rockville, MD has tree canopy (University of Vermont analyses). Confirmation is awaited that the increase of 825 acres of added canopy is real. The added trees were found "based on reanalyzed 2006 data and new 2011 aerial data" according to the press release. 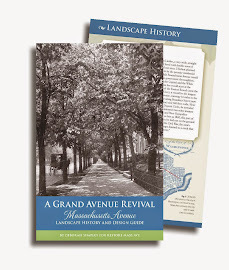 The accompanying Summary Fact Sheet does not break down how much of the gain was in previously treed areas, and how much was new canopy covering previously bare spaces, such as parking lots and streets. The UFA says it will release the data soon. "It is very encouraging to see we are heading in the right direction," said Mayor Vincent C. Gray said in the DDOT press release. On this, we can all agree! An image from the Fact Sheet is below. * DC land area is 39,269 acres (or 61.37 square miles) 2.1 per cent would be 825 acres. By comparison, Catholic University's campus area is 193 acres, according to its web site. DDOT UFA April 5 press release is here. 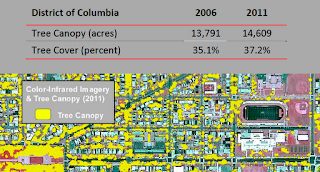 Summary Factsheet "Tree Canopy in the District of Columbia: Mapping our Progress 2006-2011" (DDOT/UFA).